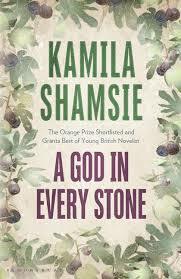 I am grateful for the invitation to write an article for the HNR about Kamila Shamsie’s historical fiction with the 2014 publication of A God in Every Stone. I read both A God in Every Stone and Burnt Shadows as part of my research and was astounded at how this author tackles so many hot-button topics in her novels. From the relations between subjects and Empire during the Raj in India to the WW2 atomic bombing of Nagasaki, to the Partition and formation of Pakistan and a inside look at the Afghan mujahedin (opposition groups who initially rebelled against the government of the pro-Soviet Democratic Republic of Afghanistan (DRA) during the late 1970s, and fought the DRA and the Soviet forces during the Soviet War in Afghanistan), even to a glimpse at modern-day terrorism. Not only does she tackle historical periods and events but also social topics like feminism, morality, cultural divisions, and everything in between. 1) Who are your literary influences? It’s such a hard thing to pin down–much more easy to talk about literary loves. I love Virginia Woolf, but I don’t know that I can claim to be influenced by her, for example. So let me pick a few loves and readers of my work can decide if there’s influence there. Earliest loves – Peter Pan and Winnie the Pooh. University-era loves: Toni Morrison, Michael Ondaatje, Virginia Woolf, Italo Calvino. More recent loves: Ali Smith, David Mitchell. I tend not to let go of old loves; just add more onto them as time moves on. 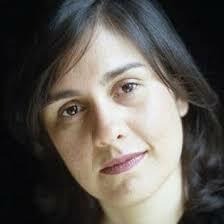 2) Do you consider your books to be literary fiction or more trade-focused? Do different novels fall into different categories? I always cringe a little at the term ‘literary fiction’ which seems to imply all other books lack literariness – or that you can either be literary or commercial (which is just insulting to readers.) Having said that, the books I read fall within the category referred to as literary fiction, and I suppose I write into that area where I read. HERE, I WAS TRYING TO GET AT THE ESSENCE OF WHO SHE FEELS SHE IS WRITING FOR, WHAT KIND OF AUDIENCE SHE TARGETED WHEN SHE CAME UP WITH HER CONCEPTS. 3) What audience are you aiming for with your books? Honestly? Anyone who’ll read them. 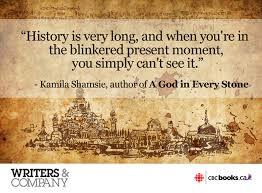 4) Your novels have been described as international historical epics- how would you describe them? Generally if someone asks me to describe my book I turn to the nearest friend or relative and say, ‘please describe my books for me.’ I suppose if I had to I’d talk about them as novels which look at what it means to live individual lives entwined with history – how to reconcile the awfulness of the world with the joy of it; how to love, how to be loyal. 5) How is your work received in different parts of the world? Different reception in the UK, in India, in Muslim countries? Have any of your books caused controversy? I don’t really recognise ‘Muslim countries’ as a category. All my books are connected to Pakistan, which is where I’m from, so of course my work is going to speak far more directly to people there than in, say, Indonesia or Iran. No major controversy that I’m aware of – though in Pakistan, there were quite a few people raising eyebrows when my novel Salt and Saffron depicted a relationship between people of different classes (that caused more of a stir than anything I’ve ever written about politics or religion). But yes, different countries have different responses based on their own histories and anxieties. With A God In Every Stone the UK responses were very much centred on the figure of the Englishwoman in the novel and the First World War, while in both India and Pakistan the Pathan/Pashtun figures got more attention as did the colonial aspect of the book. With my previous novel Burnt Shadows journalists in Denmark and Norway asked a great many questions about my thoughts on migrants – very much tied to Scandinavia’s very recent history of having to contend with having a migrant population. THE REST OF THE QUESTIONS ARE DIRECTLY RELATED TO THE TWO HISTORICAL NOVELS. 6) How did you choose the settings and time periods for these two books? There’s nothing particularly ordered about my writing process. With Burnt Shadows I thought I was going to write a book set in Karachi during the summer of 1998 when India and Pakistan tested their nuclear bombs, but that lead me to think about the use of atom bombs in Japan in 1945 – and next thing I knew I had a novel starting in Nagasaki; researching Nagasaki 1945 made me think of parallels with post 9/11 New York – so the entire geographical trajectory of the novel changed. With A God in Every Stone I was interested in exploring the city of Peshawar and thought that, as with Burnt Shadows, I would write a multi-part novel that would come up to the present day – but after writing my way from 1915 to 1981 and beginning to imagine sections in the 90’s and 2009, I discovered that actually it was the early 20th century story I was interested in, so I cut out everything later and concentrated on 1915 and 1930. And those stories lead me from Peshawar to the Eastern and Western front of the First World War. Somehow it all comes together in the end, but it’s a terrifyingly haphazard process. 7) Where did the archeological historical theme running through Gods in Every Stone originate? 7) Burnt Shadows: Interesting evolution between a bomb survivor of Nagasaki leading to a young man choosing his allegiance in the war in Afghanistan- how in the world did you get from one place to the next? Can you talk about your thought process? 8) One of the major themes threads through both books is the English-Indian relationship, and you write about the overarching themes in this relationship. 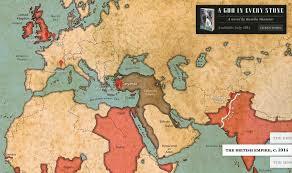 What is empire to its subjects? Was colonialism enlightenment or slavery (being treated as second class citizens)? What are your thoughts about this issue? Colonialism was a system of economic exploitation which justified itself on the basis of racist ideas about the superiority of the ‘civilised’ English over the ‘uncivilised’ Indians. Hard to see that as enlightenment. But as a novelist what I’m most interested in is how the inequality of historical positions gets in the way of relationships between people of different nations who do have a certain degree of affinity for each other. And of course there are other complications – if you’re an Englishwoman in Imperial India, as is the case with Viv Spencer in A God in Every Stone, there’s a complex interplay of patriarchy and imperialism going on. 9) We have seen in the news since America got involved in Pakistan much about the Pathan culture- did you write this book with current events in mind? If so, how did they influence this story? As I mentioned, the novel was originally supposed to end in 2009, so yes, I did very much start with current events in mind. All that changed, but I suppose what remained was an impulse to write about the Pathans in a way that goes beyond the crass stereotypes of people who live and die by the gun – in the early 20th century there was a very sophisticated and popular movement of non-violent resistance to colonial rule which I wanted to explore in the novel, while also exploring the very old syncretic traditions of Peshawar. 10) Confusion over cultural identity and loyalty to one’s nation/sect/tribe seem to be overarching themes in both books- are these things you have personally struggled over? Family history? Witnessed? What led to your focus on these themes? In some odd way, I think I’m interested in it because I haven’t considered it a struggle. It’s been pretty angst-free for me to move between Karachi, London and the East Coast; and within my own Pakistani family there’s a German grandmother, Danish cousins, England-raised mother etc etc. – none of which I’ve ever regarded as problematic or confusing to me personally. But I suppose at a certain point I realised that not everyone has the luxury of feeling simultaneously so fixed and so fluid about their relationship to nations and ethnicities and other such groupings, and that divergence from my own experience became an interesting thing to examine. Though really I’m just guessing here – I have a strange superstition about not really wanting to examine the connections between my life and what I’m interested in writing about. It’s almost as if I think the tap will turn itself off it I try to work out why it’s flowing. *Thank you very much to Meghan Walker at Tandem Literary for arranging this interview.